Seating is Limited! Pre-registration is highly encouraged! Mail registration form (click) with check to RigDzin Dharma. Call 505-401-7340 to use credit card by phone. * A limited number of work-study positions are available. * No one is ever turned away for lack of funds. RigDzin Dharma is excited, fortunate, and extremely blessed to welcome the great Drikung Yogi, Drupon Trinley Yeshe Rinpoche, to our Center to teach the sublime Dharma August 16 through 18. This is Drupon Yeshe Rinpoche's first visit to the United States. Rinpoche is one of the few most profound living teachers from Tibet who has received heart treasures from highly realized masters such as the Great Pachung Rinpoche and Gelong Tenzin Nyima Rinpoche at Drikung Thil. 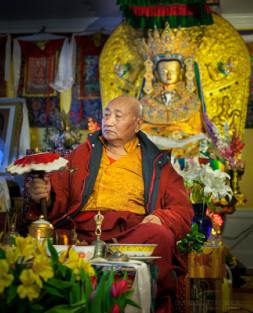 He has generously guided the most accomplished of the present generation of Drikung teachers. It is an extremely rare and tremendous blessing to be able to receive transmissions and teachings from such an accomplished yogi and master. Don't miss this extraordinary opportunity! Rinpoche will bestow the Five-Fold Path of Mahamudra empowerment composed by RigDzin Chokyi Dragpa, the first Chungtsang Rinpoche, that allows practitioners to enter into the mandala of the entire scope of Buddhist practice. 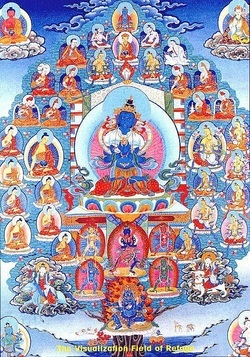 The Five-Fold Path of Mahamudra includes the practices of cultivating bodhicitta, meditating upon the yidam deity (Chakrasamvara), guru yoga, mahamudra, and dedicating the merit for the enlightenment of all beings. The Five-Fold Path of Mahamudra was transmitted from India to Tibet and synthesized into a single system of practice by the great early Kagyu master, Phagmo Drupa. Centuries later, RigDzin Chokyi Dragpa realized that introducing the entire scope of the Five-Fold Path of Mahamudra in one empowerment would singularly ripen the mind streams of fortunate disciples thereby bringing immense benefits. 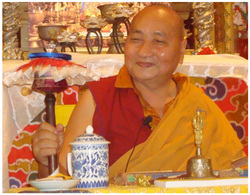 Rinpoche will teach from the Mahmudra section of The Words of Vajradhara Dharmakirti by RigDzin Chödrak. This powerful text is considered one of the most important commentaries on the Five-Fold Path of Mahamudra and is generally only given in Three-Year Retreats. It can only be taught by a teacher with great realization like Drupon Trinley Yeshe Rinpoche who has perfected the Path. 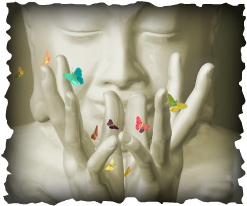 The Five-Fold Path of Mahamudra is a profound system that helps bring about realization through practical and skillful means and in essence contains the complete path to Buddhahood. Practitioners of all traditions (other Mahamudra, Dzogchen, or Madhyamika) will find these pith instructions to be of great practical benefit to their practice through the power of the blessings that flow down through a living lineage of realization right to the present moment. In this afternoon session, Rinpoche will perform special healing blessings for those with physical ailments. Rinpoche is known among his students in Tibet, Nepal and India as having the power of pacifying physical pain by the power of his healing mantra. During this session, individuals will meet with Rinpoche while the entire group will practice the healing mantra of Medicine Buddha. For the personal healings to be effective, please plan on staying the whole session so that the healing can be further facilitated by the group recitation of the mantra. Print a Flyer for Drupon! Paper the town!